The Supercops in Life OK’s popular show Shapath will be getting a larger than life persona as they will go back in time for an exciting fresh series. And what’s more, one can see costume drama at its best in this series. Yes, the long-running Fireworks Productions show will gear up for the series ‘Time Travel’ in January 2015. And this series will open up with a story titled ‘Pyaar Ki Imaarat’ wherein the cops will go back in time and reach the Before Christ era. 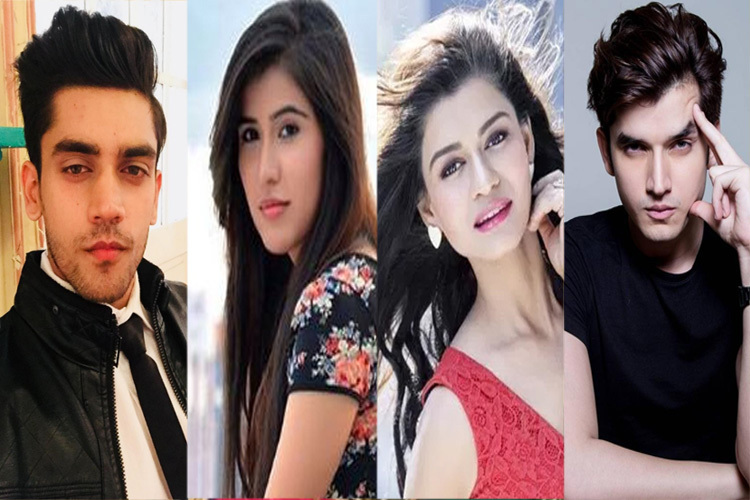 The episodic will feature Danish Bhatt, Gurpreet Bedi, Samiksha Singh and Ali Hassan. Danish will play the role of the King Yayavant while Samiksha will be his lawfully wedded wife, Mrignayani. The king who would be truly in love with his wife will build a ‘Pyaar ki Imaarat’ as a gift for her. However, their love tale will see hurdles in the form of Ali Hassan who would play an evil character who would fall for the Queen. He will try to destroy the monument of love, and will be helped by his associate, played by Gurpeet. The story will revolve around how four cops will go back in time to save and protect the Pyaar ki Imaarat. When contacted, Ali Hassan confirmed the news of shooting for Shapath, but asked us to call him later. We hear that as the story would progress, it will be revealed that Kavi will have a back story to connect with the King. This is supposed to be the biggest episode ever of Shapath, and the costumes given to the characters will be a visual treat. Watch this spectacular story on 10 and 11 January 2015. 19 years old Ruma Sharma will be seen in an upcoming episodic of Shapath on Life OK. The series produced by Fireworks Productions will have this episodic tale based on a particular supernatural power wherein the spirit of an insect would get into a human. We have already reported about Siddharth Sen of Arjun fame being part of an episodic of Shapath. In the same story will be seen Ruma, who will play the sister of Siddharth. The episodic will also have actor Micky Makhija playing Siddharth and Ruma’s father. This episodic story of Shapath will air tonight (20 December). Incidentally, Ruma’s Savdhan India episodic along with Imran Khan (already reported) will also air tonight. The good looking Paaras Madaan who was seen in Qubool Hai recently will soon don the character of a super villain in Life OK’s Shapath (Fireworks Productions). The episode will present a sci-fi story where Paaras will be seen playing Ankit who will have special powers to travel across time and planets. The story will circle around the animal kingdom and will also have a moral teaching towards the end. The shoot for the episode will start from today and it will air sometime soon. The dashing Abhinav Kapoor (Kasautii Zindagi Kii and Kavyanjali) and Splitsvilla 4 fame Dimple Chawla will soon don the avatar of an Egyptian king and queen for an episode of Life OK’s Hum Nai Li Hai Shapath (Fireworks Productions). We earlier wrote about actor Zuber K donning the avatar of a super villain for the ongoing series Earth v/s Earth. He will be seen playing the powerful villain Muzammik from the other planet who will have super powers. He will be seen sending across his alliances to create havoc in the world. And now we have learnt that this time Muzammik will send an Egyptian king and queen who had died thousands years ago and brought back to live by him to create a furor in Earth. The particular episode will air this weekend. While some actors bid adieu to television and take a plunge into films, >Barkha Bisht Sengupta is definitely not that kind as she is back to hit the household screens and entertain viewers post her stint as Kesar in the Bollywood movie, Ram-Leela. The beautiful lady, will be seen entering in an episode of Life OK’ Shapath (Fireworks Productions) as the Super Villain who will possess powers to kill people with her ability to sing. She will essay a triple role and will be seen in three distinguished black avatars. The episode is scheduled to go on-air this week. We wait to see the talented lady back on television soon! Productions has roped in Parul Chaudhary to play an episodic role for the third time. Life OK’s Shapath (Fireworks Productions) has once again roped in talented actor Kunal Bhatia for its upcoming episode. This time around, Kunal will essay the role of a heart broken guy who will get lost in a jungle. With no way out of the deep and dense jungle, he will find harmony and peace in nature and use the carnivorous plants as weapons against people while domestic plants as friends. Stay tuned in for more updates!!! International model and ace South Indian actress Surbhi Prabhu, who has charmed audiences via her films and item numbers in Telugu and Tamil films, has been roped in for a special episode of Life OK’s Shapath (Fireworks Productions). The story will follow the concept of Bollywood movie Krrish 3 on how a child (Surbhi Prabhu) has been infected with skin disease and a scientist drugs and uses her for his wrong doings. Shedding some light on her character Surbhi stated, “It will so happen that I will become a chameleon who will rob people and kill them. The episode is expected to air on 21 December. Furthermore, in the coming weeks we will also see Manit Joura, who earlier played the wolf-man in Shapath, playing a super-sonic man in an upcoming episodic. He will be a person who would rob banks and do all sorts of illegal activities using his super power. To top it all, he will challenge the police force openly, and the cops will have their task cut out in nabbing this super villain. Life OK’s Hum Ne Li Hai - Shapath (Fireworks Productions) is all set to air yet another super sinister episode where Bulbul (Divyaalakshmi) will get hypnotized by a villain. Yes, the very simple-pretty looking wife of inspector Kavi (Aamir Dalvi), Bulbul will get hypnotized by a villain (being played by Priya Bhatija) who has a brain of a 12 year old. Interestingly, Bulbul will fail to remember any of the cops or her husband in this episode. And during this phase the audience will witness a fight sequence between Bulbul and Inspector Kashish (Karishma Modi). Interestingly these ladies are great friends in real life thus, fighting with each other did not come naturally to them. “Yes, this is my first fight sequence on screen but, it’s also with my best friend on the sets Karishma,” said Divyaalakshmi. Interestingly, Karishma also makes it a point to give diet tips to good friend Divyaalakshmi. This is a real goodie goodie scenario!!! Aksshat Gupta who essays the scheming Abhimanyu in Zee TV’s Do Dil Bandhe Ek Dori Se will now be seen as a ‘Super Villain’ in Fireworks Productions’ very popular cop-based thriller, Hum Ne Li Hai…Shapath on Life OK.
Aksshat will go on to play a psychotic scientist who gets a thrill by shrinking up people with the use of his machine. In other words, he reduces humans to miniatures with the help of his inventions. The story will deal with the manner in which this mad scientist misuses his powers and how the cops stop him from indulging in more and more notorious activities. When contacted, Aksshat confirmed that he will begin shoot for Shapath very soon. Get ready to watch yet another interesting tale in the Life OK show. Life OK’s sci-fi drama Hum Ne Li Hai - Shapath (Fireworks Productions) is all set to see the entry of the faceless man. As seen so far, Bulbul (Divyaalakshmi) has got married to the love of her life, inspector Kavi (Aamir Dalvi). But now that she has started getting bored at home, she will decide on taking up a job of a school teacher. The audiences will witness her enjoying her stint with the kids, until the faceless man makes an entry. As per a reliable source, this faceless man will be searching for someone with the sixth sense to foresee his future. This is when he will come across a girl named Naina who will be a part of Bulbul’s class. It will be interesting to see if Bulbul manages to save the kid from the clutches of the faceless man. This particular episode will air on 19 October 2013.